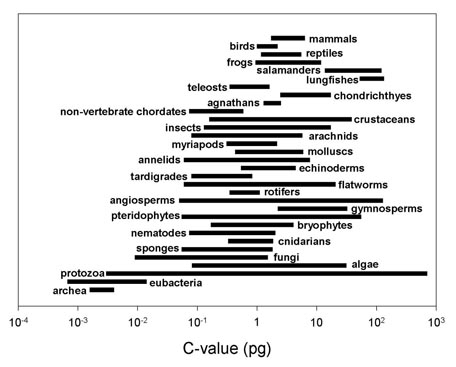 Chromosome number differs across species. Is the amount of DNA comparable between organisms, just being split into smaller chunks in those species with more chromosomes, or do species have different genome sizes? If so, does the genome size correlate roughly with the complexity of the species? Different species do not have the same genome size. Genome size is not correlated with complexity. 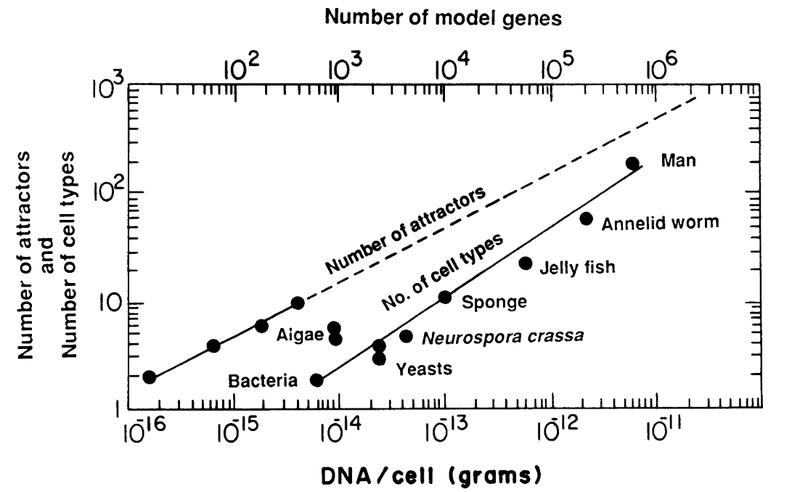 Organismal complexity can be hard to define but, qualitatively, I think we can all agree that a human is more complex than a single-celled alga. And yet, humans have a genome that is 80 times smaller. This is known as the C-value paradox. Note, however, that this paradox has been resolved after it was found that the genomes of most eukaryotes contain a large proportion of non-coding and repetitive DNA. It is already mentioned by canadianer that genome size differs between organisms. But what about complexity? First we should define what complexity is: complexity can be defined as number of different cell types that a multicellular organism can produce, with the same genome. Yes complexity does not correlate with genome size. However, it seems to correlate with number of genes. According to Kauffman, the number of cell types i.e. complexity is linearly correlated (direct correlation) with the square root of number of genes. Though Kauffman says that complexity increases with DNA content, which is not actually true, it is certainly possible that that complexity is correlated with number of genes. The book is a little old and certainly molecular and cell biology has seen a lot of progress in this time. However, theoretically higher number of distinct genes should produce more complex phenotypes which Kauffman justifies using his NK-model. This assumption has again been disproved. The catch would be that exact duplicates/polyploid genes should not be counted as different genes. Moreover metabolic genes should also not be counted (plants/bacteria have a higher number of functional metabolic pathways). Organismal complexity arises because of the complexity of gene regulatory network which in-turn is dependent on the number of regulatory genes. NK model also in a way assumes regulatory genes (i.e. genes that can interact with each other). Surely complexity cannot arise out of nothing. I can't find the data for this at the moment but the theory is quite strongly plausible. Another point I would like to add is that complexity need not only mean spatial complexity. Complexity can also be temporal. I can show the facts here. Not the answer you're looking for? Browse other questions tagged molecular-biology dna chromosome species genomes or ask your own question. Why high quality DNA should be between 10 and 20 kb?